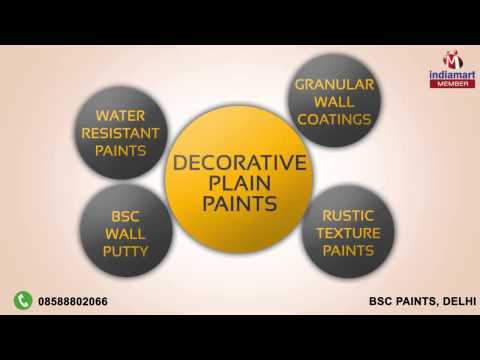 Welcome to BSC Paints, established in the year 1970, we are one of the leading manufacturer and supplier of a comprehensive array of Decorative Paints, Textures, and Stone finishes. Our array comprises Synthetic Wall Spray Paints, Granular Wall Coatings, Water resistant paints, Roller Coats, Metallic Rustic, Flakes and Decorative Plain paints. Apart from these, clients can also avail Acrylic Wally Putty, Washable Acrylic Wall Putty and many more from us. The products offered by us are formulated using qualitative pigments, solvents and other ingredients sourced from certified vendors. All our products are developed under the strict vigilance of our experienced professionals in accordance with the international quality standards. Moreover, our products are widely applauded among the customers for their excellent finish, accurate composition and quick drying. All these products are marketed under the brand names like Mava, Magma, Ultra, Ultimata, XGuard, Patina, Satty, BSC Royal, Stonecem, Micra, Delta, Max, X-Guard, Wall Plast.